Some downloaded or streaming videos require authorization in order to preserve copyright restrictions (for example, Netflix). The 'Protected Content' area allows you to configure settings which allow these services to identify you. 'Allow sites to play protected content	(recommended)' – If disabled, it blocks webpages from playing protected content. 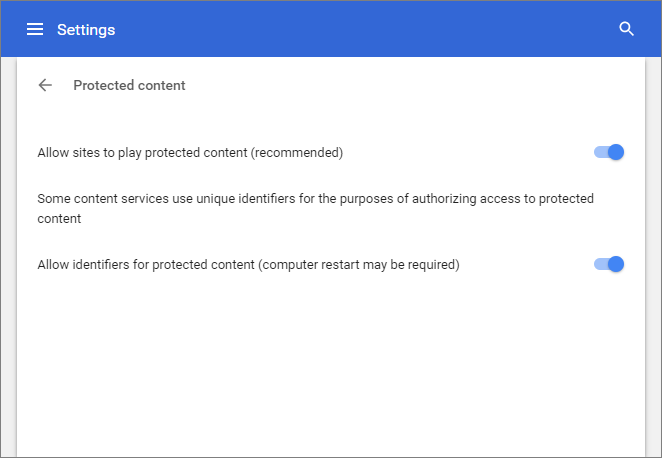 'Allow identifiers for protected content (computer restart may be	required)' - Disable access. Please note, this may prevent you from watching some protected content.